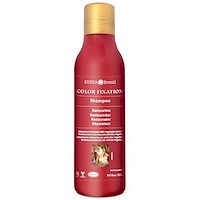 Untangles and protects color-treated hair, providing intense brightness, smoothness and volume reduction. Formula enriched with Cupuacu butter and Buriti oil (natural absorbents of ultraviolet rays), rice protein, 15 herbal extracts and natural exotic fruits from India and the Amazon rainforest. Spread a small amount of product on palms of hands. 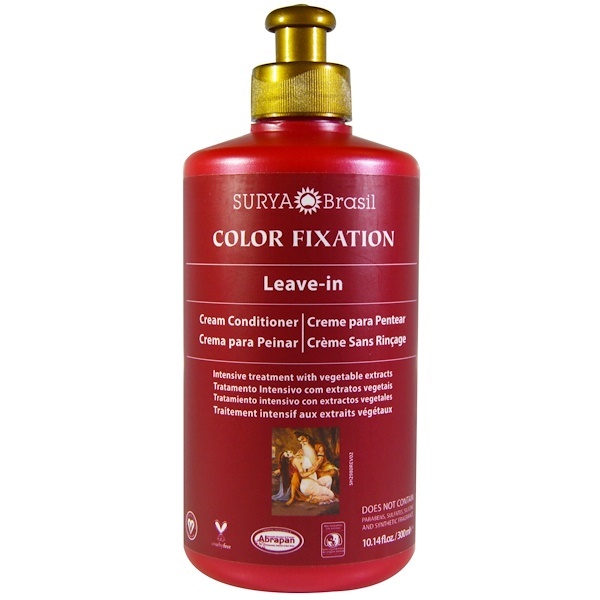 Apply on wet or dry hair. Do not rinse. Can be applied daily. 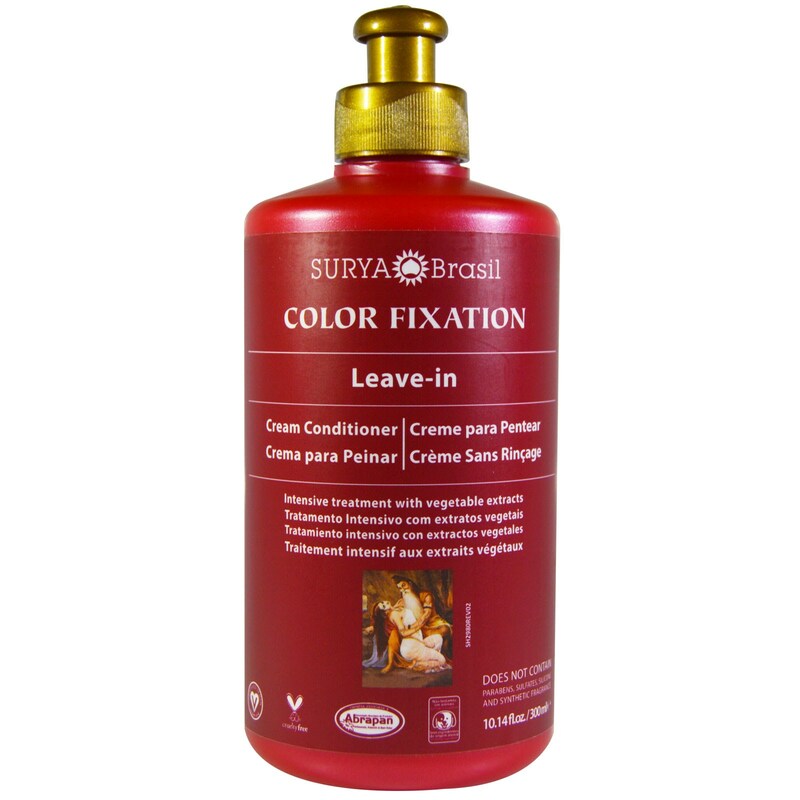 For best results, use with the Color Fixation Restorative Hair Mask and the Color Fixation Single Application. Aqua cetearyl alcohol, behentrimonium methosulfate, sorbitol, orbignya oleifera seed oil, dehydroacetic acid, benzyl alcohol, cetrimonium chloride, lawsonia inermis leaf extract, arnica montana flower extract, phyllanthus emblica fruit extract, paullinia cupana fruit extract, genipa americana extract, achillea millefolium extract, malva sylvestris extract, corylus rostrata seed extract, daucus carota sativa root extract, euterpe oleracea fruit extract, ziziphus joazeiro bark extract, aloe barbadensis leaf extract, malpighia punicifolia fruit extract, bertholletia excelsa flower extract, chamomilla recutita extract, theobroma grandiflorum seed butter, hydroxyethylcellulose, hydrolyzed rice protein, cananga odorata flower oil, citrus limon fruit oil, citrus sinensis peel extract, citrus aurantium amara flower oil, Mauritia flexuosa fruit oil, tocopheryl acetate, citric acid. 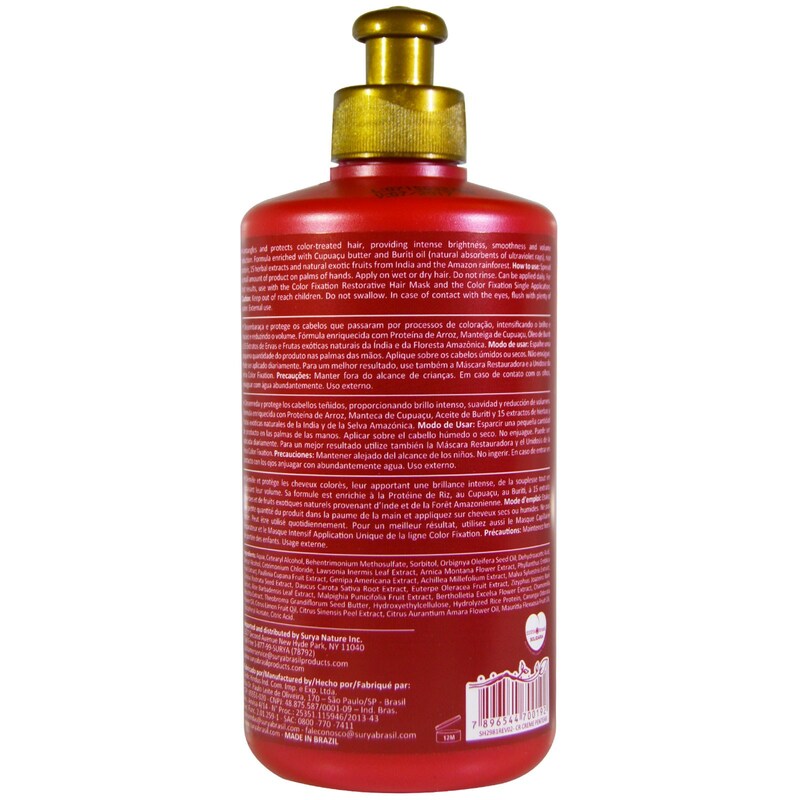 Does not contain Parabens, Sulfates, Silicone and Synthetic Fragrance. Keep out of reach of children. Do not swallow. In case of contact with the eyes, flush with plenty of water. External use.